Whale hello! We have had the absolute pleasure of viewing both transient and resident killer whales for the past few weeks now. While the season is just underway, we have been viewing some great action out on the water! 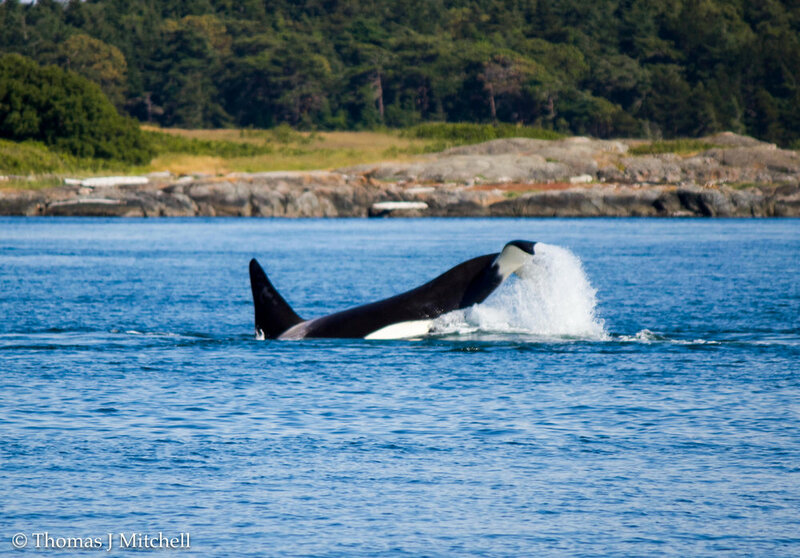 Recently our guests encountered transient killer whales feasting on harbour seals! We are looking forward to making your whale watching dreams come true for the 2019 season! Stay tuned for a lot more incredible sightings and make sure to come out with us to see the beauty for yourself. Sightings Report - Season 2019 is here! We are back!! After what felt like a long cold winter, it is great to be on the water again. According to various news outlets Victoria experienced more snow than any other Canadian city in February. But with the sun shining and cherry blossom trees blooming we are optimistic that spring is coming! After the first week on the Salish Sea, we cannot wait for what peak season will bring! Since running the first trip last Monday we have encountered seals, sea lions, playful Dall’s porpoise, orcas and even sheep! 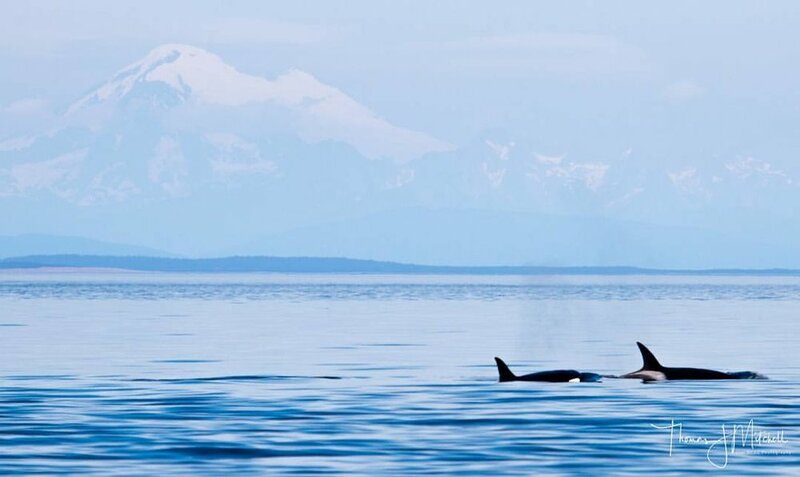 So far all the action has been taking place in the San Juan Archipelago, where the islands create high currents through narrow channels and great hunting opportunities for orcas! On March 6th a large pod of Dall’s porpoise played with BC Luna right before they saw Mouflon Sheep on Spieden Island. Even though they did not encounter whales, everyone had a great time and received 20% money back along with a return stand by tour! Over the weekend several groups of orca combed the area for prey, often splitting up then coming together to share their meal. What a lovely way to start the week!! The skies were clear and the sun was bringing the heat to the capital region! We spotted multiple humpbacks feeding in the morning, as well as several pods of Bigg's Killer Whales (mammal eaters) throughout the day. We were very lucky to encounter these mammal-eating orcas as they successfully hunted porpoises. Our captains also made a stop at Race Rocks Ecological Reserve, which is especially beautiful on a sunny day like today! A couple of our vessels really lucked out when they stumbled on a grey whale, a rare sight here during this time of year. Captain Jim and Captain Kaegan came across some very curious Bigg's Killer Whales again in the afternoon, as well as some more humpback whales, sea lions, otters, and seals. After such an awesome day on the water, we're so excited to see what tomorrow brings!! Happy hump day!!! What a beautiful day to be on the water! The sun was shining with calm winds all day! In keeping with the theme, our fleet caught up with some breaching humpbacks through the Juan De Fuca Strait!! They are here for the summer to feed on small plankton, abundant in these waters. They are thought to breach as a way of communication, as there is a loud noise created when their bodies hit the surface of the water. There was approximately 10 individuals in the area, with a mother and calf pair! A stop by Race Rocks Ecological reserve is always a treat! A small chain of islands littered with local pinnipeds (seals and sea lions) sunning themselves on the shorelines! They are often heard barking at one another, competing for space. Another day with perfect whale watching conditions!!! Our captains couldn't wait to leave the dock! In the morning our fleet headed northeast of Victoria in search of whales. It wasn't long before a group of Biggs Orca (mammal eaters) was picked up near the Tsawwassen Ferry Terminal! The pod was spread out looking for potential prey, and once they locked onto an item they gathered together to share it. Once finished, they celebrated by socializing and playing with one another! In the afternoon we caught back up with the same pod, identified as the T124's, who have been around all month! It was another beautiful summer day in Victoria! Our fleet left the dock just as the sun came through the clouds. Calm waters are great for spotting whale blows, and it wasn't long before whales were seen!! We set out early and caught up with 6 humpbacks feeding throughout the Juan de Fuca Strait, a mother and a calf pair among them! As Captain Russ was heading towards reports of whales, he picked up a pod of Biggs Orca (mammal eaters), identified as the T124's!! Good eye Captain!! We have been encountering this family a lot lately, they must be eating well! A stop by Race Rocks Ecological Reserve is always a hit with the passengers!! This small chain of islands is often littered with local pinnipeds, including seals and sea lions. They are often seen basking in the sun along the shores and barking at one another. A few Elephant Seals have been hanging out there recently! A scorching hot day in Victoria! Our sightings have been so awesome lately, and we were excited to cool down on Salish Sea and see what action was taking place! Captain Russ picked up a group of Biggs Orca, identified as the 65A's, travelling with a large male, T175!! First seen of off Sidney, travelling north. We love to interact with this pod and watch the newest calf grow! Humpbacks were also encountered feeding throughout the area. One is known as Heather, a whale encountered each season! As our fleet headed back out for afternoon tours, our captains had options! There was Biggs orca (mammal eaters) sighted north and south of Victoria, so our fleet split up. One group was in Sansum Narrows by Sidney! While the other was seen in Washington state waters near Port Angeles. ~ Stay tuned for whats next! It was a hot and humid day in the capital region. Clouds moved in by the afternoon, and trapped the heat from the morning sun. Lucky for us the water conditions remained calm into the evening, so we sent out a sunset tour!! A group of Biggs Orca were first spotted by Pender Island, identified as the T99's and T36A's. They were travelling north, against the current, scanning the area for potential prey. This ecotype feeds on other marine mammals including seals, sea lions, and porpoise! It wasn't long before they were snacking on their latest catch, then seen celebrating by tail lobbing and rolling on their backs at the surface! We love to see happy whales!! In the afternoon our captains caught up with other Biggs orca identified as the T37A's in US waters were they were encountered travelling along the coast of Lopez Island! We headed back out for a sunset tour and caught up with yet another Biggs Orca group in Cowichan Bay! They were identified as the T65A's and T124A's with a large male, T175. Thats a lot of whales socializing!! In the 165A's there is a small newborn calf, seen in this photo taken by Peter Wilcox of Whale Watch Tenerife (Canary Islands) earlier this season! By the end of the day we encountered five different pods of Biggs Orca!! Its amazing to see how well these whales are doing compared to their salmon eating cousins (Southern Residents). ~ Stay tuned for what we encounter next! !